Hannah Lane, the seven year old girl we remember from The Power, The Miracle and The Dream, is now 22 years old and a “Pulitzer Prize winning photographer and renowned peace activist” (Ch. 1). She is with a National Geographic team that has just landed on Mars, and has become officially the first woman to set foot on the planet. Hannah has come a very long way since her loosing childhood days as an asthmatic, but how exactly did she get here? Was it really the secret of “the power within … [her] … mind” (Ch. 12) that brought her to these heights? 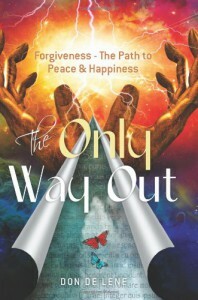 The Only Way Out: Forgiveness - The Path To Peace & Happiness takes us deeper into the spiritual philosophy set out in De Lene’s earlier book, concentrating on our desire to hurt others, and the solution of reconciliation through absolution. We can never really be at peace unless we are willing to forgive wrong. In this book De Lene digs deeper into a metaphysical view of the world, particularly the idea of God, however, the philosophy presented is not at all ‘orthodox’ religion. De Lene instead derives his inspiration from the non-fiction book A Course In Miracles (Helen Schucman. Foundation for Inner Peace:__ 3rd ed. :__ 2007). De Lene’s book is an unusual blend of novel and teaching manual, and is a very enjoyable and easy way of looking deeper into philosophy. Set not too far into the future, the novel has elements of science fiction, such as the “video phone” (Ch. 2), permanent Moon and Mars bases, and the “Intelligent Traffic Management System” (Ch. 21), where cars are robotically steered. Most of the life depicted, though, is very familiar to the reader, and indeed the book concentrates on ‘ordinary’ life and the all too common problems such as work and relationships. The book is not science fiction in the true sense of the word. A great deal of the 29 chapter book is plot line which entertainingly dramatizes the philosophical points, though there are four teaching chapters which deliver ideas in a chatty, but more instructive way. The books structure is divided into two parts of roughly equal length: Chapters 1 to 16 and Chapters 19 to 29. Chapters 1 to 3 are introductory, covering the events of Hannah’s childhood and adolescence. Some of this section recaps very briefly the events and philosophical points raise in the first novel in the series. Chapters 4 to 11 cover the teaching and learning experiences surrounding the new idea of forgiveness. Chapters 11 to 16 are wholly narrative and cover the events surrounding Hannah’s contact with National Geographic and her first working trip to Kakado National Park in Australia. These chapters also cover the beginning of Hannah’s friendships with Meiling Wang, “Editor In Chief of National Geographic” (Ch. 5), and Alexander Messina, an apparently arrogant but very gifted staff photographer. In Chapters 17 to 24 the plot takes on a truly international theme in which the troubled world of the Middle East is explored, and in which the idea of synchronicity or “meaningful coincidence,” (Carl Jung. Synchronicity: An Acausal Connecting Principle, in The Structure And Dynamics Of The Psyche:__ 2nd. ed. :__ Princeton University Press, c1969, p. 426) is dramatized. Chapter 25 is an adventurous interlude covering exciting action on the moon. Finally Chapters 26 to 29 explore the outcome of the earlier events surrounding the Middle East. As would be expected from the sub-title of the book the main theme is forgiveness. We all hurt and we all do harm, and this seems to be a fact of life, but is there a solution which practically works? We freely talk about forgiveness, but what does it really mean? What about retribution and justice? Are they ignored if we forgive? Success is a second theme strongly running through the novel. We want to get ahead in the world, but how do we do that? Is success simply making money, or are their deeper values we can judge ourselves on? Are money making and values opposed? What should we do with our personal success, or is it an end in itself? The three main characters are immediately likable and indeed this seems to be one of the benefits of the philosophy they each espouse: we like ‘nice’ people and want to be friends with them, even if we don’t agree in every detail of what they say. Hannah is in the main positive in her attitude to life. She does have moments of negativity (Ch. 3) and to a certain extent she underestimates her own ability, but she is a high achiever: the kind of girl we all wanted to be friends with at school. She of course is very successful, but she never ceases to be amazed at this, and even more puts in the work learning her photography. She does not assume she ‘knows it all’: indeed she is known for her “determination” (Ch. 2). Meiling is even more successful, but she too has worked to get there. She is perhaps less certain than Hannah in her philosophical approach to life, but the two women work well together and from the beginning we wish the best for their friendship. Alexander, behind his exterior of conceitedness, is jovial, admits his faults and is willing to pass on his skills as a photographer. These three people move the book forward as we at first wonder about them, get to know them and then hope for their plans. As we have already mention, this is in part a teaching book and some of the ideas put forward should be mention and looked at in more detail, though there is too much to cover in a short review. Synchronicity has already been mentioned. De Lene’s take on the subject is that “there is a reason behind everything” and that each event provides an “opportunity to learn more about ourselves” (Ch. 2). In essence a person should “set your goal … [and] … synchronicity will take care of the rest” (Ch. 2). De Lene proposes that there is an element of “spirit” in life. He speaks of “the power within his mind, connected to spirit” (Ch. 2 and following) and also of “spirit or God” (Ch. 2 and following). In many ways, though, this element remains undefined. People pray to God (Ch. 15) and one minor character who claims to see God’s angels seems to know Hannah’s future (Ch. 4), but the picture of God remains distant. Can we honestly ever truly know the spiritual in complete detail? On the other hand there is a detailed ‘creation story’ of sorts in the novel and here many readers may experience considerable resistance. We are encouraged, as a result of this story, to believe that we should forgive because all of life is an illusion, a dream, because “nothing really happened” (Ch. 9). Most readers would respond that this dream seems very, very real and so does the pain we suffer. Similarly in Chapter 13 we read of a near death experience (NDE), which seems to confirm De Lene’s notion of a God filled with only love. This experience, as described by De Lene, is in agreement with much of the psychological literature, especially Raymond Moody’s Life After Life (Bantam Books, 1976). It should be noted, however, that Maurice Rawlings in Beyond Death’s Door (Bantam Books, 1985) reported encountering just as many negative NDE’s as positive. Judgement and hell seem very real. These metaphysical notions of illusion and an all-loving God, though, are not central to the book and are not needed in order to understand and appreciate the main point of forgiveness. The “ego” (Ch. 2 and following) is a central notion in the book. Primarily it is seen as being “controlled by … negative emotions” (Ch. 2), chiefly “guilt”, and because of this it divides us from others so that we see ourselves as “separate selves” (Ch. 7). There is also the notion of “holy relationships” (Ch. 10) which basically says that if two ‘right minded ’people work together huge amounts can be achieved. All these teaching points are dispersed throughout the book and are often integrated into conversations arising out of the plot. There are quite a few women characters in the book and virtually all of them are successful and dynamic in one way or another. We have already talked of Hannah and her career as a photographer. Meiling reveals herself from an early age to be “creative” (Ch. 12) displaying a talent for painting. She is also intelligent and is successful in school. She displays winning physical ability at sport, being a state champion at “badminton” (Ch. 12). Like Hannah, she is characterized by a determination in all that she does. As “Editor In Chief” (Ch. 5) she has reached the top of her profession. She is no ‘pretty silly thing’ of the 1950’s. Anna Messina, Alexander’s partner, is a psychologist who earlier in her life worked in “a prestigious medical center in Washington” (Ch. 20). Hilda is a “social worker” (Ch. 4) who Hannah meets. She is head of the “Community Refuge Center” (Ch. 4) in Australia. She is very knowledgeable in her field. Professor Amy McLaughlin, who initially teaches Hannah at university, is “highly regarded in photographic circles around the world for her technical expertise in the field of photography, as well as for her innovative ideas” (Ch. 5). Feminists will be pleased by this book as the women display both emotional and social intelligence, determination and business nous, all of which enable them to achieve. The two most prominent male characters in the book, Alexander and Nathan (Hannah’s boyfriend), both outwardly fit the traditional male role of tough, rough men. Alexander is full of pride and Nathan is a hard drinker. We at first feel these men would very much be at home in the 1950’s. Alexander, however, actually has a very soft side which he has learned to develop as a result of great personal hurt, and Nathan shows that he can learn to listen and change his ‘macho’ ways. De Lene’s novel shows the benefit of Gender Studies and will be a challenge to some men. Minorities are represented by Meiling who is an immigrant from “China” (Ch. 12). Here difficulties on coming to a foreign country, the U.S., are mentioned. As we have seen she perseveres to success. Minorities and the dispossessed also are mentioned in the novel in the form of the Palestinians, in the Middle East, and Aboriginals, in Australia. While mentioned, though, their presence is not really dramatized. The Palestinians very briefly appear in the character of Ramy, a youth who has had great personal hardship, but Aboriginals must be represented simply by their rock paintings. Also both these groups are to some degree represented as being helped by others, rather than being self-possessed. A book centring so much on personal overcoming and empowerment would have been considerably enhanced by dramatizing these minority groups more. The elderly appear in the character of an “old bag lady … Doris” (Ch. 4). While being bereft personal possessions because of “bad choices” (Ch. 4), she possesses a remarkable friendliness, joy of life and wisdom. This is a dignified picture of this often ignored group. LGBTIQ characters are completely absent. Once again, in a novel dealing with empowerment, it is unfortunate that this group is ignored as including them would have added extra dimensions to the ideas expressed. In terms of the Marxist/Capitalist debate, and the accompanying discourse on power, it can be noted that De Lene’s novel is not at all hostile to personal wealth. The Wang’s are well off and the Messina’s live in a mansion with extensive gardens. The characters globe trot with ease. De Lene, however, very much considers what should be done with this wealth. Hannah gives her first large earnings to the Community Refuge Center despite her own personal need. She is aided in her causes to improve the lot of the suffering by her rich friends at National Geographic. Her plans to increase world peace are resisted by governments and those with “vested interests” (Ch. 29). Hannah is aided in her cause by ‘people power’ rather than ‘the system’ (Ch. 26 & 27). This interesting balance of viewpoints makes for good reading and reveals a refusal to be trapped by any one dogma. Novels mainly aim to represent ‘real’ people and ‘real’ life, so the field of psychology, which aims to find truths about human nature and behaviour, becomes relevant. De Lene’s novel is no exception. Brenda, Hannah’s imaginary, fairy ‘spirit-guide’ will seem to many to be the most unbelievable part of the novel. The psychologist Carl Jung, however, believed that ‘archetype’, knowledge bearing sub-personalities deep in the unconscious, could become manifest to the individual in visionary appearances. Jung indeed experienced visits from, and received wise advice from, Philemon, a visionary guide (Anthony Stevens. Jung: A Very Short Introduction:__ Oxford University Press, 2001, p. 30-32). De Lene has Hannah feel she is “to blame” for the sexual abuse she receives from Bruce, her mother’s boyfriend. Psychologists have indeed noted this effect in victims (Psychology Today. 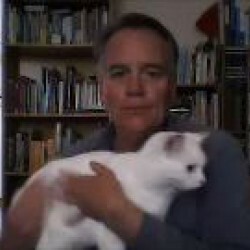 To Forgive Or Not Forgive: That Is The Question: http://www.psychologytoday.com/blog/the-compassion-chronicles/200803/forgive-or-not-forgive-is-the-question - Accessed 08/10/2012). Meditation is represented as a valid way of relaxing and gaining balanced personal insight (Ch. 4 & 6), though it is not purported to be an easy method of personal development (Ch. 18). Psychology indeed supports the idea of the benefits of personal peace and insight coming from meditation (Harold H. Bloomfield, et al. TM: Discovering Inner Energy And Overcoming Stress:__ Dell, c1975, Ch. 5 & 6; and, Andy Fraser, ed. The Healing Power Of Meditation:__ Shambhala, 2013, Ch. 3-6). De Lene includes the use of a journal to record personal insights, for later referral (Ch. 6). This cognitive technique of journaling has been shown to be of use (Morton T. Kelsey. Adventure Inward: Christian Growth Through Personal Journal Writing:__ Augsburg Books, 1980). De Lene has his psychologist character Anna Messina decide that her clients are too much persuaded by her colleagues to blame others in their past for their problems (Ch. 20). Anna believes that instead her clients should accept “personal responsibility for their lives” (Ch. 20) and this is certainly very much in tune with the thinking of both Existentialist psychologist Rollo May (Freedom And Destiny:__ W.W. Norton, c1981, p. 96-101) and William Glasser (Reality Therapy: A New Approach To Psychiatry:__ Harper Row, 1975, p. 16- 23). This psychological accuracy very much adds to the validity of De Lene’s message. Following from psychology it should be noted that the novel has a little symbolism. Brenda is of course a fairy. Writing from a psychological perspective Rose Inserra (Dictionary Of Dreams: Understanding Dreams And Their Messages:__ Hinkler Books, c2002, p. 163) notes that fairies “usually represent wishful thinking and belief in the possibility of magic existing in the world, rather than reliance on the practical”. Jean Chevalier and Alain Gheerbrant (The Penguin Dictionary Of Symbolism:__ 2nd ed. :__ Penguin, 1996, p. 369) on the other hand, describes how the history of the idea of the fairy goes right back to primal, elemental forces, indeed to the “Earth Mother”, and as such they can be seen as primary creative forces in our psyche. As Chevalier and Gheerbrant write, they symbolize “the paranormal powers of the spirit or the extraordinary capacities of the imagination” (Chevalier, p. 368). J.E. Cirlot (A Dictionary Of Symbolism:__ Barnes & Noble, 1993, p. 101) agrees with this point of view, describing them as creative beings who bring about change and “transformations”. De Lene, as we have seen, proposes a real element of “spirit” in the world which we are meant to take seriously (Ch. 2 and following). The imagination, creatively seeing our true purpose as expressed in our life goals and actions, is also very important in the book (Ch. 2). Both these elements of ‘spirit’ and ‘imagination’, when perceived in the right way, can bring about great change. In tune with this transformational nature James George Frazer certainly describes how fairies in traditional tales can give “valuable information” to people which transforms their life for the better (The Golden Bough: A Study In Magic And Religion:__ Macmillan Press, 1976, Pt. VII, p. 227- 228). As Hannah’s ‘spirit-guide’ Brenda certainly gives very wise advice, even if the reader does not agree all the time. Eric Ackroyd (A Dictionary Of Dream Symbolism:__ Cassell, 1993, p. 167) indeed says that “in a woman’s dream the fairy symbolizes her mother, her own femininity, or some part of her which, if allowed to participate in the conscious organisation of her life, would bring enrichment.” The approach to life outlined by Brenda could certainly be said to be more intuitive, more feeling, more relational, and thus more feminine, and as has been said enriching. In The Only Way Out De Lene gives deeper insights into life, concentrating particularly on forgiveness, though the teaching goes much further than that. The book also examines success, and takes a balanced stance in the Marxist/Capitalist debate. The characters capture our interest and will be pleasing to those readers interested in Feminism and Gender Studies. De Lene quite competently draws on psychology to make his novel more factually based, and there is some interesting symbolic content. I am happy to rate this book as 4.5 stars out of 5.